She put the lie to the old adage. 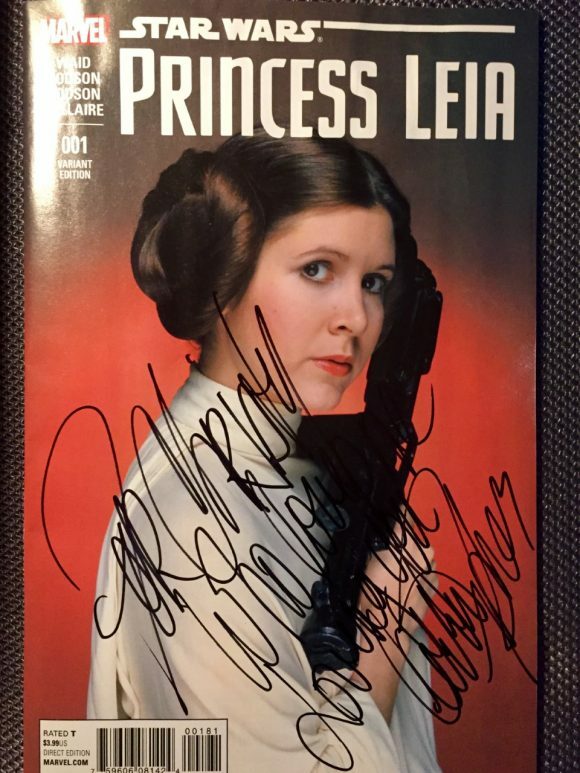 — For 13 COVERS: A CARRIE FISHER Princess Leia Salute, click here. — Writer Vito Delsante pens a love letter to his first crush. Click here. I was talking to a friend of mine the other day in my shop about Robert Vaughn and how I miss his presence on Earth, and I teared up a little. He said that he just doesn’t get attached to celebrities like I do. It wasn’t that he doesn’t care, he just isn’t as emotional as I am. I reacted badly when REDACTED killed REDACTED in The Force Awakens. I reacted badly at the end of The Hobbit: The Battle of the Five Armies even though I knew how it ended. Watching Rogue One was amazing because even though I didn’t know all those characters, I really did. In 1977 and for many years after, my friends and I WERE the rebel spies that stole the Death Star plans, so I felt I knew them already. Anyway, I decided to write this column about one of my absolute favorite heroes in the universe whom I was lucky enough to meet. And she has been in the news lately for good and bad reasons. I have all the faith in the Force that she will pull through because she is super-tough! And stubborn! A few years ago I was contacted by the amazing people at Indiana Comic Con about moderating a panel and they asked me to submit my resume. I thought it a bit odd until I found out that it was for the Carrie Fisher panel and I needed to be approved. This, for me, was a dream come true. Princess Leia was going to know that I existed. While I was always Han Solo (I had the gun) when the neighborhood kids played Star Wars (which was a lot), Princess Leia was my hero. She was one of the women who shaped the person that I am today. She taught me that you could be tough, tender, smart, loving and pretty badass all at the same time. And while she was rescued, she was the one that ended up saving everyone, including the entire rebellion. She was more than a princess. She was awesome. And in my mind, she was my friend. 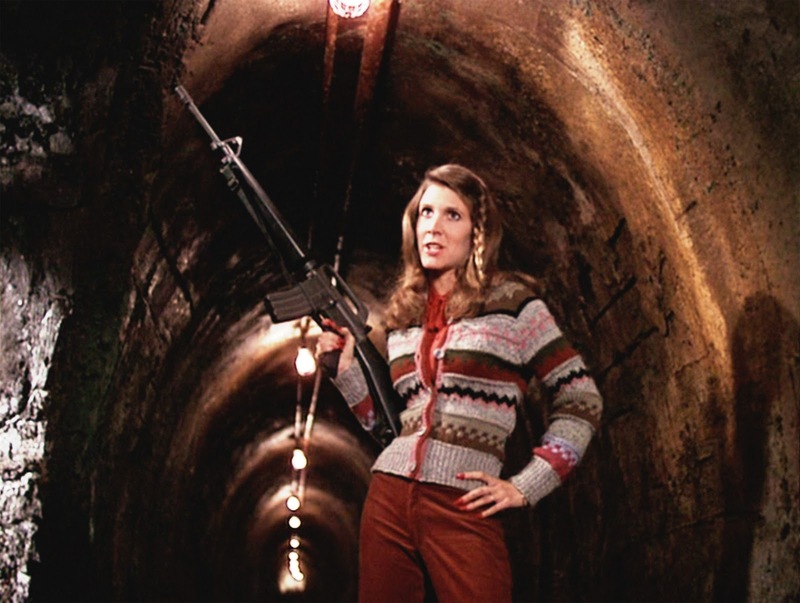 And it wasn’t just because she was Princess Leia. She was an author, she was a script doctor, she was in The ‘Burbs (one of my favorites and one of the most underrated movies ever! ), she hung out with Jake and Elwood, and the list goes on and on. When I got the news that she approved me as her panel moderator I was over the moon (not a space station, a moon!). I decided what I would wear, and came up with an awesome way to end the panel that even made me cry a little. The day came around and I was super-nervous. I went to the panel room and decided to go outside because I was really warm (wearing my favorite Star Wars sweater was NOT one of my best ideas but I loved it too much not to). I saw a dog outside and was drawn to it like a tractor beam had locked onto me. I went over and pet the dog and then noticed a pair of legs behind it. Before looking up, I said, “I love this dog.” A voice said “thank you” and I looked up. It was Carrie Fisher. I stood up awkwardly and introduced myself as the panel moderator. I’m not sure if what I said was coherent, but she was kind and said to come over and meet her group of people. So for the next 15 minutes, I was in a group of people chatting with Carrie Fisher. She talked about ideas she had and then would look at me and say “What do you think?” to which I respond “That’s brilliant.” Because she is brilliant. The panel started. Carrie came on stage. Gary came on stage. I had to help Gary into his chair because he was not interested in jumping up. He was adorable and Carrie gave him lots of kisses. Who wouldn’t?!? At the end of the panel, I told Carrie I had one thing left to do. I started the Throne Room music with my phone up to a microphone. I told Carrie at the end of Star Wars (aka A New Hope) that Han and Luke (and presumably Chewie later) all got medals but she didn’t. I told her that she deserved one. 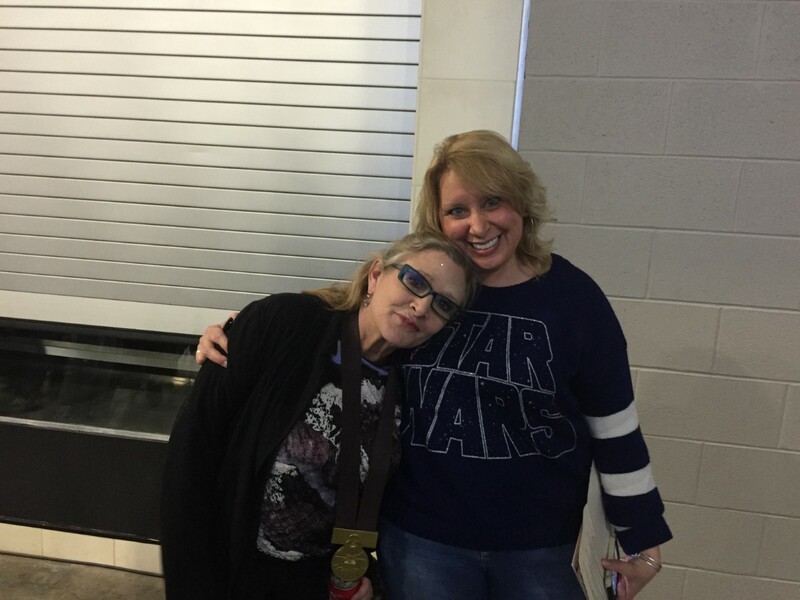 Then I gave her a medal — the one that came with a replica of Luke’s jacket that I got. The audience applauded, Carrie got a little misty eyed and she hugged me. I was on Cloud 9 for quite some time. Then I got another call from Tampa Comic Con, the same people that run Indiana Comic Con. They asked if I would moderate the panel for Carrie Fisher in Tampa. It took me less than 12 parsecs to say yes. That’s a story for another column. After something like that, I am quite alright with being emotional about my heroes and my favorite movies and television shows and books. My life is wrapped up in popular culture. And if something makes me feels less lonely, more loved and included, it’s not a bad thing. It’s an amazing gift. I think that’s something to celebrate and I plan to keep being the way I am, naysayers be damned. I owe a lot to pop culture for keeping me going all these years. Star Wars especially and I thank every single person that had anything to do with it. So if you love something, just love it and be thankful for it and the joy it brings you. Now, excuse me, because I think I am going to go watch Rogue One again. AMC still owes me a birthday popcorn, anyway. But really, I don’t need an excuse.